Can Iowa maintain high rank? 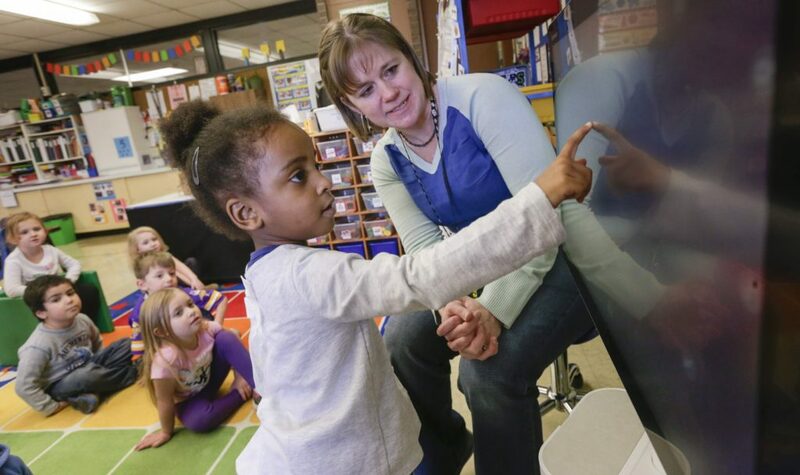 Boosted by past policy decisions, Iowa has become a leader in child economic well-being. according to one national study. But the Hawkeye State is beginning to lag on children’s health. Iowa is among the top five states in the 2017 Kids Count Data Book, compiled by the Annie E. Casey Foundation. The study ranks states based on 16 indicators in four areas — health, education, economic well-being and family and community. The group says these are key factors in determining a child’s ability to thrive. Nationally, Iowa ranks third among states in economic well-being. It’s also among the top 10 for education (sixth), health (seventh) and family and community (eighth). The Hawkeye State’s composite ranking is fifth in the nation, following New Hampshire, Massachusetts, Vermont and Minnesota. “Iowa’s fifth place ranking overall reflects the importance people in this state place on providing for children and families,” said Michael Crawford, Iowa Kids Count director with the Child and Family Policy Center in Des Moines. Since 2010, Iowa experienced a 3 percent increase in the percentage of children living in single-parent families. Child poverty, which had been decreasing, showed no change between 2014 and 2015. These two indicators are often linked because, generally, children raised in single-parent homes are more at risk for living in poverty. And, although Iowa placed in the study’s top 10 for child health, the state is beginning to fall behind compared to the national average. There’s been no change in the percentage of children not covered by health insurance compared to 2010, despite a national percentage decrease of 38 percent. This is partly because, unlike other states, Iowa robustly pursued child health through the Hawk-i program. Still, with federal changes to health care up in the air, it’s difficult to know how future policy will impact state or national statistics. Cuts or caps to assistance would, of course, decrease affordable and realistic access for underprivileged kids and their families. Similarly, the 34 percent birthrate decrease among Iowa teens since 2010 will be negatively impacted by changes made by the General Assembly. Caps to family planning funding, and program changes resulting in a decrease in access to contraceptives will halt and ultimately begin to reverse this progress. Such changes are already underway in states that followed similar family planning paths. A more detailed look at the status of children in the Hawkeye State is available through Iowa Kids Count, which is compiled by Child and Family Policy Center. Just as some states do better in different areas, similar differences can be seen among Iowa’s 99 counties. When discussing access, in particular, geography matters.